Keystone Compliance is the COMPLIANCE Lab for IEC 60601-1-2 testing per the European Union Medical Device Directive (93/42/EEC) and/or FDA 510k requirements. The Electromagnetic Compatibility (EMC) standard for testing medical electronic equipment is the IEC 60601-1-2 test standard, which is harmonized with the EN 60601-1-2 test standard. 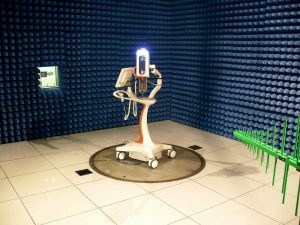 IEC 60601 1 2 EMC testing is recognized around the globe to ensure that Electromagnetic Compatibility failures do not create unnecessary risks to patients, medical professionals and/or Medical Equipment/Systems. Electronic medical devices must comply with the EN 60601 1 2 EMC test prior to the devices entering the market. The IEC 60601-1-2 fourth edition is the most current edition of the EMC standard. However, many devices in services may need testing to previous editions like the EN 60601-1-2 third edition, second edition or first edition. While there are many accredited test labs throughout the world that can provide the necessary IEC60601-1-2 compliance testing, there are very few compliance labs. Most test labs follow a process that includes the four boilerplate steps of quoting, testing, report writing and invoicing. Whether the medical device meets the IEC60601 / EN60601 requirements or not, the process at the test lab is the exact same. An IEC 60601-1-2 test lab provides manufacturers with consultative guidance and feedback during the testing process. Keystone Compliance is recognized as an industry-leading EN 60601-1-2 EMC test lab because of our experience in identifying, communicating and resolving failures during compliance testing. No lab can guarantee compliance of every device they test to the EN-60601-1 test standard. However, engineers with devices that have failures during testing, learn more about the cause of the failures and receive more guidance on how to resolve those failures at Keystone Compliance than they do at any other lab. That unprecedented consultative engineering has made Keystone Compliance the IEC 60601-1-2 compliance lab and one of the fastest-growing companies in the country. It is the reason so many of our customers drive past or fly over other test labs to work with us. Whether your EMC testing requirements are to the IEC 60601-1-2 4th edition, 3rd edition, 2nd edition or 1st edition, Keystone Compliance is the best EMC compliance lab to meet your EMC testing needs. Contact Keystone Compliance to partner with the experts who offer short lead times, thorough reports, unprecedented consultative guidance and the best IEC 60601-1-2 and EN 60601-1-2 test experience in the industry.